Joanna has sent me this award. It is my first. Thank you, Joanna! (Not janet!). I really enjoy this woman's site. So, now the rules state that I must post this award, and nominate 7 blogs I love. Then I have to supply a link to those favorite places I get inspired, and tell you 7 things about me. Here are some of my favorite sites: These are truly talented and interesting women. Raluca, Beth, Karen, Iris Z, Suki, Tif, Kirsty, and Ida . 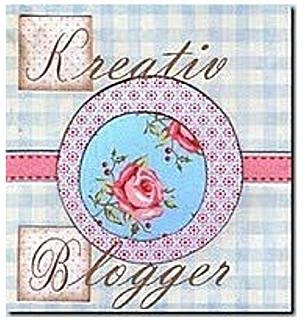 I really love to follow all of your blogs. You each inspire me by your words or your art or both. 3. My housework can get neglected when I am playing. So at around 4ish, I run around like a mad woman cleaning, scrubbing, so it LOOKS like I was about this all day. 4. I have about 1,000,000 unfinished art projects, painting, embroideries, carved stamps, collages, all over the house. I counted. Can't seem to get them to look the way I want. Sometimes, I throw them out. 5. Nobody has ever bought any of my work...I don't sell it...but one of my biggest paintings somehow got hung in the big cancer center next to my house. My friend saw it and called me. Ha, makes me want to go check it out incognito! 6. I love God! Yes I do! Pray all the time that He would help me with ( #4 above) and for a lot of other things, and to thank Him for my life. 7. I have had some sorrows but more joys in my life of 44 years. And I wouldn't trade away any of those experiences. The joys put color in my life, the sorrows gave me understanding. I am well satisfied...well except for #4 above. Wow! Did you get to the end? You must be drinking some strong coffee! Have a wonderful day. And check out my blog list above. They are really terrific! Diane, glad to learn more about you! Dear Diane, Well thank you for the award .... what a wonderful surprise. It is my first and I am tickled pink to receive it, I will do my best to brighten some of my favorite bloggers day also! How fun! Thank you for your kind words + I'm happy that you like my work. I appreciate it.